Dr Paul Hill looks at composite repair technology, the high value it can offer in the oil and gas industry, and the importance of an active management plan and demonstrable design performance. Among the multitude of services and technologies available to maintain and repair plant that is damaged or weakened by factors such as corrosion or erosion, few can match the proposition offered by composite repair technology. This is a solution that can provide permanent restoration of pressure integrity and structural strength, with no requirement to shut down or purge the line, avoiding the need to cut and replace which is often the only alternative. For an industry seeking integrity, reliability, and longevity, with low maintenance, the benefits are clear. 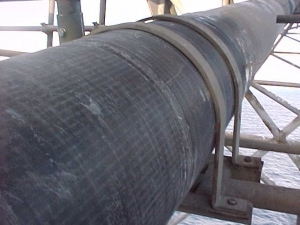 Composite repairs can restore and refurbish pipes and pipelines (including elbows, tees, nozzles and other configurations), tanks, pressure vessels, caissons, platform decks and other structures, typically to pressures of 200barg and temperatures of 210°C, with a design life that can be up to 20 years or more. No hot work is required, and no disruption to operation, and the repair is generally only a few millimetres thickness, is light in weight (less than a quarter the density of steel but ten times the strength), and corrosion-free. Importantly, to capitalise on the flexibility offered by this technology, composite repairs should be purpose-designed to meet customer requirements, whether for a short-term repair to last until the next planned shutdown, or permanent rehabilitation of a structure such as caisson or platform deck, carried out while the plant operates as normal, to negate the need for costly replacement and extend asset life. Furmanite's team of engineers, for example, can design a demonstrably reliable repair to match the need in line with the specifics of the application, and deliver the most cost-effective solution. With the introduction of national and international ASME and ISO standards, design and installation requirements are now more clearly defined, removing much of the inconsistency that was associated with some early repairs using this technology. But two potentially variable factors remain vitally important; an active management plan for any repair to ensure it does not 'outlive' its design life, and demonstrable performance of design and competence in installation. Composite repair designs will take into account a number of critical factors, from the design life required, the size of the damaged area and shape of the defect, the geometry, the internal pressure and temperature, and the substrate material, to whether there is sufficient good metal onto which to overlap the repair, and the load-bearing contribution of the substrate. The lifespan of the repair is critical. Any composite repair should have a quantified, demonstrable design life (which could be 20 years or more, or just a few months) with fully documented justification, and will require an active management plan. The Composite Repair Active Management Service (CRAMS) from Furmanite is available to help operators comply with regulatory requirements in this respect. The service logs the composite repairs on any one plant or platform, providing a comprehensive record accessible to the operator via a web-based programme, with password access. Moreover, the system will flag up when repairs are approaching the end of their design life, enabling the operator to be alerted that the repair is due for review, so that revalidation or other action can be taken. Demonstration of competence in installing composite repairs is equally vital in ensuring the reliability and integrity of the repair. It is a common misconception that application of composite repairs is simple, when it is in fact a highly skilled and specialist procedure. A number of factors are critical to success, from surface preparation (which ensures the strength of the repair bond, and therefore the lifetime performance of the repair), to the number of layers applied, the extent of overlap onto good metal, the gradient or taper at the ends or edges of the repair, and fibre orientation. Technicians must be highly trained and qualified (Furmanite, for example, was instrumental in introducing a recognised independent qualification in this skill, reflecting the importance placed on training by the ISO standard) to install composite repairs to complex structures to the highest standards. Importantly to operators, this allows supporting documentation to be provided to demonstrate competence that is increasingly a regulatory requirement around the world. Examples of composite repairs in application are numerous, and demonstrate many of the advantages. In one case, when replacement of a 30 inch hydrocarbon gas pipeline suffering external corrosion in multiple locations on a platform in the North Sea was deemed impractical, composite repairs provided a solution. A total of over 28 metres of bespoke-engineered repairs were installed at some 17 locations along the carbon steel export header gas line, where the corrosion had caused wall thinning. Fourteen different repair designs were required, ranging in length from one to over four metres and involving various complex geometries including elbows, branches and stabbings. Given the numerous damaged areas, the only other option - to cut and replace the line - would have led to increased safety concerns and logistics issues, rendering it impractical. In an altogether different scenario, Furmanite's composite repair and strengthening technology was applied to extend the life of an amine stripper column suffering from internal corrosion, for BG Tunisia. 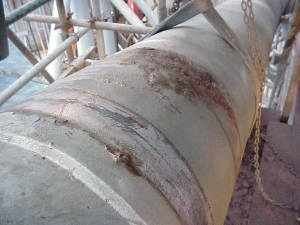 In this instance, at the Hannibal plant processing gas from the Miskar field, the corrosion had caused lining failure and resulted in wall thinning in a number of areas on the 30 metre high, 3.35 metre diameter column. Four areas measuring up to two square metres in size were repaired, to avoid unplanned downtime and extend the stripper life until the next scheduled shutdown when it was due to be replaced. Offshore, examples include repairs to avoid costly replacement of caissons. Although considerably more challenging than repairing pipes and pipelines in terms of design and engineering expertise, composites are ideally suited to such applications, capable of being designed to cater for the complex loading requirements and indeed allow for total loss of the original caisson steelwork, effectively providing a permanent new structure but, importantly, one created while platform operation continues. The rehabilitation of a clean water caisson on an offshore platform in the North Sea, after wall loss was discovered due to internal root erosion of circumferential welds, provides one such example. The repair was designed to provide the necessary high axial strength to support the self-weight of the caisson, and the bending strength to withstand external loading from wave action, taking into account static and fatigue strength and buckling and transverse shear, using significant modelling and FEA analysis. The result was a caisson repair that is stronger and stiffer, yet lighter, than a steel replacement would have been, and that is corrosion-free. Similarly, composite repairs can be valuable in addressing problems with separator vessels offshore that are often related to internal or external corrosion. In one example on an FPSO, some 16 areas of internal corrosion were found in a carbon steel separator containing hydrocarbons and water, with up to an 83 per cent loss of wall thickness in some areas. Traditional repair options included shutdown and replacement, or labour-intensive welding, both with significant costs attached. Instead, a purpose-designed composite solution to this corrosion problem, engineered to take account of the complex loading requirements, provided an alternative that restored full pressure containment and structural strength, and avoided the need for welding or replacement. Composite repairs represent a valuable weapon in the maintenance armoury, allowing repairs and full rehabilitation to be carried out without requiring shutdown or disruption to operation, typically delivering valuable savings, and helping operators to meet vital maintenance needs while still maximising asset uptime. Dr Paul Hill is global composite repair business development manager for Furmanite, Kendal, UK. www.furmanite.com. Dr Hill has worked with composite materials targeted for use in the oil and gas industry for some 20 years, following completion of his PhD at Cambridge where he investigated methods for predicting the performance and durability of fibre-reinforced polymers in offshore and civil engineering environments.